Malaysia is a multi-ethnic and multi-racial society composed of various diverse peoples. Each ethnic group in Malaysia follows its own religion and celebrates its own festivals. In fact Malaysia’s public holiday calendar is quite packed for it features various different festivals celebrated by the various ethnicities that make up its population. These festivals are usually celebrated nationwide or then at a state level. The ‘Open House’ concept during which friends and relatives are invited around to take part in the festivities is practiced during all major festivals in Malaysia. Actually the leaders of Malaysia have made the ‘Open House’ concept a main stay of major festivals like , Hari Raya Aidilfitri, Chinese New Year, Deepavali, Christmas Gawai Dayak (the harvest Festival in Sarawak) and Pesta Keamatan (the harvest festival in Sabah). During ‘Open House’ leaders from royalty to politicians open their doors to visitors from all over the country no matter where they hail from. Recently, the Malaysian Prime Minister Datuk Seri Najib Razak and his wife, Datin Seri Rosmah Mansor, welcomed more than 100,000 visitors to his official residence, Seri Perdana on the first day of Aidilfitri. Special transport services were set up to provide passage for people wishing at attend the open house at the prime minister’s residence. The doors of Seri Perdana stayed open from 10.30 am to 4pm for the ‘Open House’. Aside from the prime minister and his wife, several senior cabinet ministers were also present for the event which was undertaken as a nation building initiative with the aim of promoting unity and harmony amongst the people of Malaysia. On a personal level as well most Malaysian host an ‘Open house’ for the celebration of major festivals. During these events relatives and friends can stop by without a formal invitation and they are usually supplied with much home-cooked food and drink during these sessions. 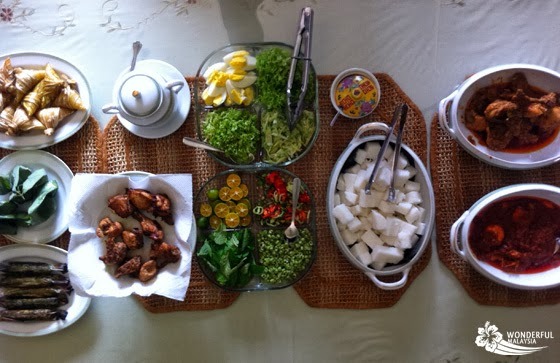 Popular foods served at a festive ‘Open House’ include eats like Rendang tok(dry beef rendang), Ketupat Palas(steamed rice cakes), lemang( a glutinous rice based dish), Satay(grilled meats) and Dodol(a sweet toffee like concoction) amongst others. So if happen to be visiting Malaysia during one of its many festivals, do try and attend a traditional ‘open house’ to get a taste of the legendary Malaysian hospitality for yourself.